We Were Soldiers is based on the book We Were Soldiers Once…And Young written by Lieutenant Colonel Harold Moore and Joseph L. Galloway, the only journalist willing to go into the front lines to capture a first hand account of the war. But not soon after Lt. Col. Moore and his troops touch down, their position is compromised and they find themselves outnumbered almost 5 to 1 as one of the world's most historic battle begins. While at war, we’re introduced to journalist Joe Galloway (Barry Pepper) and despite the strong military background of his family, Galloway wants to capture the war through images and writings so that people back in America can understand what happens on the front lines. During the height of the battle, Command Sergeant Major Basil Plumley (Sam Elliott) instructs Galloway to trade his camera for a gun. Though Galloway takes to battle like the others and even carries a soldier’s charred body to a rescue chopper, he eventually throws his gun down and returns to taking pictures. The cinematography is very striking and has a journalistic feel, as if we are on the front lines looking in on the action as told through the lens of Galloway’s camera. As soldiers are shot and wounded, their blood splatters on the lens. Many of the battle scenes are shown in slow motion, using quick edits that are choreographed to moving scores and songs meant to evoke emotion. Quite a moving war movie that will leave most viewers questioning this turbulent time and the amazing characters that they followed. 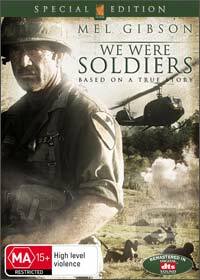 With great video and audio quality, We Were Soldiers is an impressive movie and match that with some interesting special features and this DVD could be recommended to a variety of people and considering that father's day is coming up soon, what better gift for those war mad fathers. Gripping... and engaging.